Basically I agree with this comparison except I think the Polaris should be in the #1 spot. 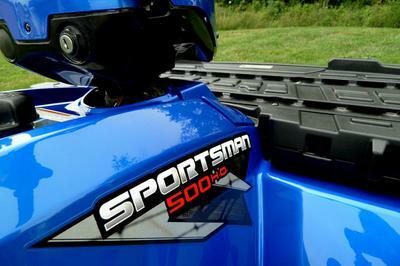 I may be biased because I own the identical Sportsman 500 efi Deluxe, except it's a 2008. However, I looked at several machines and bought the Sportsman over everything else because I thought it was the best machine you could buy at the time. I still own it. Here's why. 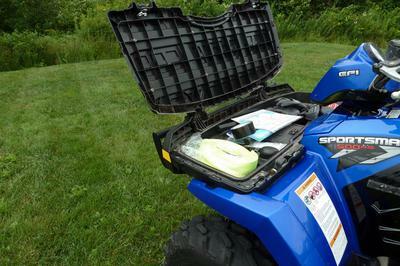 EFI - starts easily even in cold weather and high altitudes. Paint - tough & great looking. Engine braking - works very well. Decent control - applies engine braking to all wheels & limits speed to 5 mph - it's confidence inspiring on very steep hills. Wheels - beautiful machined chrome aluminum wheels. Tires - 26 inch tires vs. 25 inch tires on everything else. Ground clearance - more than everything but Arctic Cat. Suspension - IRS and struts give a stable, comfortable ride. Twin brake lights with reverse/work lights. Three headlights - the pod light turns when you turn the bars. Frame - "tough as nails". But really - you can't go wrong with any of these machines, they're all nice. I disagree with the guy that said Honda was the most stable because of it's solid rear axle. Those Honda's are tough but they will beat you up on the trail with their harsh ride. They're hard on the back on day-long trail rides. They also have very jittery steering. Thanks for the great comments on our 4X4 ATVs comparison. 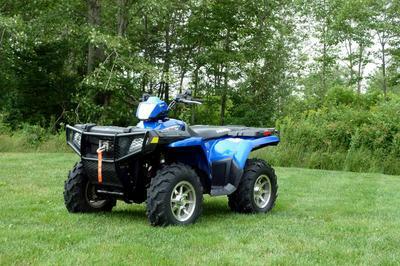 We love hearing from actual owners and their real world experiences with these four wheelers. 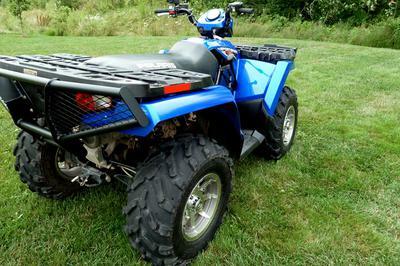 Great points about the Polaris Sportsman 500. Return to 4x4 ATVs Comparison.